When the very talented Sina Mizrahi (from Gather A Table) came up with the idea of having a virtual potluck Shabbat dinner, I immediately jumped on the bandwagon. In real-life potlucks, I am always in charge of desserts but for this virtual potluck, I chose a savory dish. Every Friday night meal, in between the salads (or salatim) and the main course (usually a meat or chicken) we have a fish entree. The fish is usually a Moroccan recipe that is traditional to the Sephardic community but varies depending on the family's traditions (you can find my recipe for Moroccan fish with olives on the blog). But for this potluck I wanted to bring something that is a little more special to me. You see, on every Shabbat that was extra special (like a birthday, a siyum...), my grandmother would make this delicious red snapper recipe. It's a flavorful dish filled with lots of fresh herbs, spices, charred tomatoes and lemons, with the added bonus of tender and crispy potatoes that soak up all that yumminess. My cousins and I used to fight over who would get the burnt trimmings. Naturally, those trimmings were the ones with the most intense flavours and, being the oldest grandchild, I somehow always managed to win. The ingredients for this fish are quite simple but put together, they create a dish that is nothing but. The original recipe calls for a red snapper, but I could not find any at my fish market. The fish pictured is a porgy (or sea bream) and was just as good in this dish. 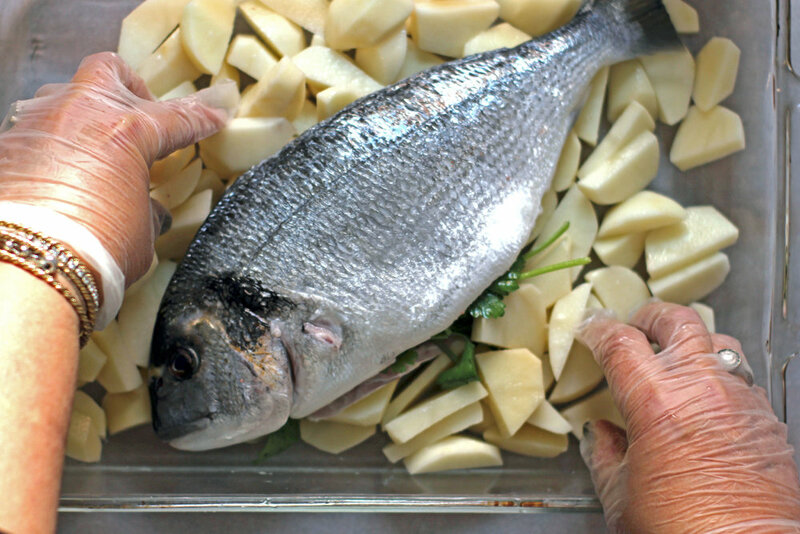 The making of this fish is very simple, just stuff the fish with the herbs, layer all the ingredients in an oven proof dish and cook uncovered in the oven. The magic happens in the oven. To get the desired effect, it needs to cook at a relatively high heat uncovered so that the lemons and tomatoes get a nice char while the rest cooks. Start by adding the saffron to the hot water and set aside (if not using the saffron you can use cold water). Lay the fish in an ovenproof baking dish and fill the inside with 3/4 of the parsley and cilantro. Put the potatoes around the fish. Add the garlic cloves, then layer the tomatoes, lemons and herbs on top. Grate the fresh turmeric over the whole dish, sprinkle the paprika, salt and pepper generously. Add 1/4 cup water/saffron to the bottom of the dish and drizzle olive oil over everything. Cook uncovered for about 45 minutes until everything is cooked and the tomatoes/lemons are charred. If everything is cooked but the vegetables aren't as charred as you like, place under broiler for 1 minute keeping an eye on it.